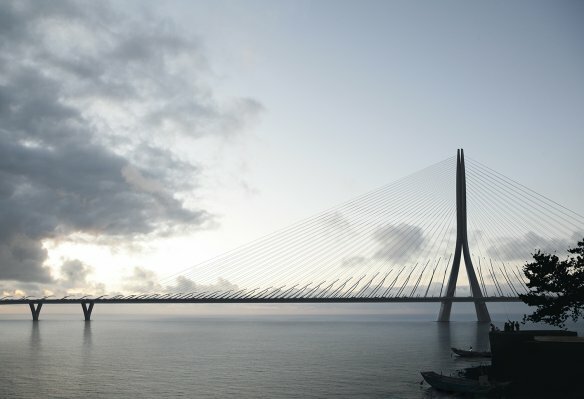 Construction is now under way in Taiwan of a single-mast, asymmetric cable-stayed bridge. The 920m-long Danjiang Bridge will span the mouth of the Tamsui River, which flows through Taipei. The bridge design is by a joint venture of Sinotech Engineering Consultants and Leonhardt, Andra and Partner with Zaha Hadid Architects. It has been designed to minimise visual impact by using a single concrete mast to support its main 450m span, which will carry dedicated road, cycle and pedestrian lanes. The 200m mast has been engineered to be as slender as possible. The design also accommodates future expansion of the Danhai Light Rail network across the Tamsui River. Construction of the US$405 million bridge is scheduled to take 68 months.